What Is the Role of Performance Management in Human Resource Management? Performance management in human resource management allows a company to set proper benchmarks for employees to achieve. Performance management in human resource management allows a company to set proper benchmarks for employees to achieve. These standards can also help a company discover each employee’s knowledge, skills, and abilities (KSAs) for their position. Another use of performance management in human resource management is to find strong employees who are capable of more responsibility perhaps in a promotion. The human resource director and employee’s immediate supervisor are typically those responsible for setting standards and conducting the review process. Feedback is also part of this process as it helps explain the gap between expectations and actual results. KSAs are those specific traits each employee brings to his or her job. Not all jobs require the same KSAs, and not all employees will have the same KSAs as part of their natural work characteristics. Performance management in human resource management can help the company compare the KSAs a worker says he or she has to actual job performance. In some cases, a company may be willing to develop a certain skill or trait in an employee’s skill set. If this is the case, performance management helps the company determine how well an employee responds to specific training methods. The goal of performance management in human resource management is to set effective standards. Otherwise, the review process will be all for naught as the standards do not provide any meaningful results for employee measurement. Effective standards should include an objective look at employee performance, communication between the employee and other workers, and how well the company follows internal company policy, among a great many other standards. Each employee may not be held to the same standards. Most times, a company will have different standards for each department or group of employees. Employee reviews in performance management should often follow a standard process. For example, the review process may include a bi-annual or annual review for each employee. A standard process allows the company to measure current performance and create a trend for each employee. Therefore, the performance management in human resource management creates the ability for a company to determine which employees are worthy of bonuses or increased compensation and those who are not. Additionally, employees who are consistently poor in their performance may be removed. A company should ensure it follows all legal requirements for performance management reviews. Many different laws exist that can restrict a company’s review process. Failing to follow these laws and regulations can result in the company facing penalties or fines. Employees may also not want to work for a company with a poor review process. What Is Human Resources Benchmarking? What Are the Objectives of Human Resource Management? How Do I Keep up with Human Resource Management Trends? What Are the Benefits of Human Resource Management? 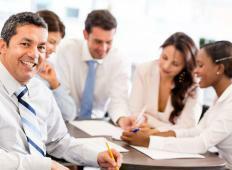 What Is Involved in Human Resource Management Training? What Is the Difference between Personnel Management and Human Resource Management? What Is the Role of Diversity in Human Resource Management?